I don’t think we’ve featured any BMX-related products for a while, so to redress that balance, how about this BMX tote bag. 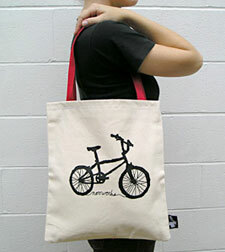 This Natural tote is made of 100% cotton and lined, measures 13 inches x 15 inches and features a big and bold silk screened BMX image, along with logo of designer Noonworks. Note that the straps are actually black (not red as in the picture). Available now, you can pick it up for $25 (which is around £14).